It is very likely that you have an old rotary phone dial lying somewhere around the house for no reason. Well, it is about time to connect it to PIC microcontroller and find some use for it, maybe a digital combination lock with no keypad? Firmware is written in MBasic and it is available for download. 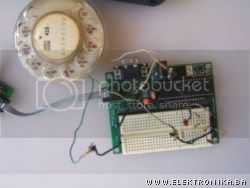 Microcontroller used in this example of interfacing the rotary phone dial is Microchip PIC16F877, but you can use any other microcontroller you like with a few modifications of firmware source code.